Yep, we’re another episode down of Married at First Sight and sure enough there was dramarama…perhaps the most so far. Taken on an emotional roller coaster of epic proportions, here were 61 thoughts we had while watching Married at First Sight tonight. 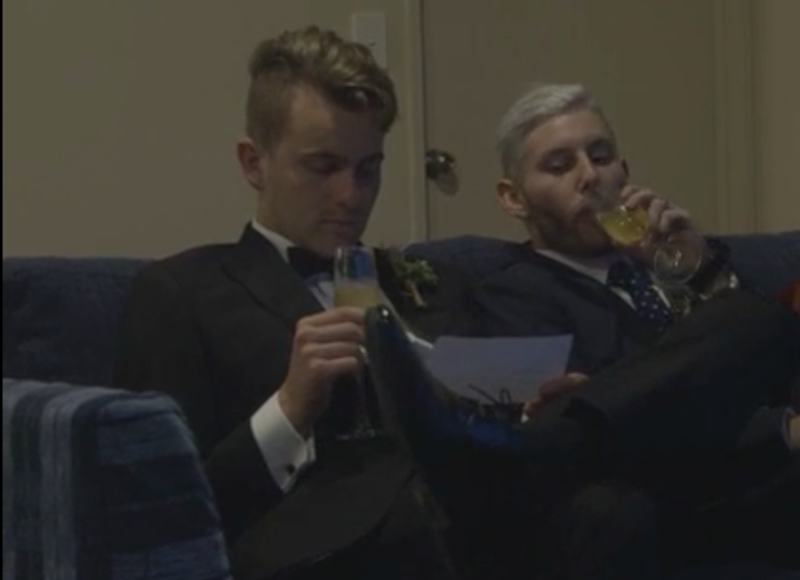 Ok, MAFS, we ended on a low last week. Let’s pick things up—we want the fairy tale, too. It’s Bel this week and she feels like she wants to pass out? This is gonna be goooodd. Nawww Andrew’s bringing Vicky food. Nice work. Hang on, what? You slept in the same bed? Oh, THREE, you played us! And oh…the breakfast is pizza? Not quite as romantic as we thought. They’ve got all the love this morning. Vicky: “What am I going to do with you?” Andrew: “Clean me.” You should be able to do that yourself, bad boy. Andrew hinted at bed antics, Vicky says she’s not feeling physically attracted to him…who is telling the truth? Oh yay! Brett and Angel are still smiling. Okay! Who are the next couples? Hayden is a primary school teacher. We likey. He’s a wrestler? It all makes sense. "When it comes to Bel, there’s an elephant in the room." There is indeed. I’m confused, Hayden needs someone who can stand up to him and Bel is almost too nice. Remind me how this is a good match? You’ve covered all the continents? Impressive, Ben! Forget about him, Ben. Nobody deserves a cheater. 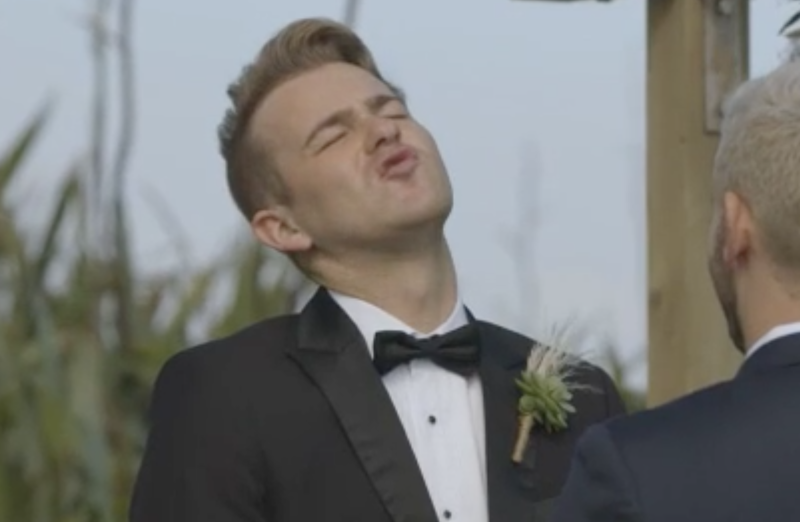 Hey Tony and Pani, we think you’ve done it right with Ben and Aaron. #crossingfingers. Hang on, so Ben’s parents don’t support the experiment…does this mean they had the head’s up? Ben’s friend: “So it’s kinda like an arranged marriage?” Why didn’t we think of this? Ben: “Hopefully he’s as attractive as me.” Keep those standards! Bel’s friend: “Getting married will be another way to find love.” Yes. Yes, it is. Hayden: “If it doesn’t work out it’s Divorce City.” Why are you talking about divorce before you’re even married? Aww Bel, you look gorgeous. “If I saw myself wearing this I would be pretty stoked.” Ben doesn’t really do Kiwi humility. Nawww Hayden’s mum, you bring tears to our eyes too. Hayden: “I just hope she’s got a smile on her face.” Us, too. He wanted to run away? Is he joking? Aaron keeps smiling at Ben and Ben is avoiding eye contact. This is awkward AF. Just the face you want to see when your husband is asked if he wants to marry you. CRINGE. This wedding is a f*cking train wreck. Ok! Bel and Hayden’s turn. Let’s go! Oh gawd. Bel’s getting cold feet. Bel: “I’ve been waiting patiently. I was ready half an hour ago.” Actual no words. Awww these two are so happy! Hayden: “Is she on top or am I on top?” A bit soon, don’t cha think?! Bel: “Let’s do it.” Freudian slips left, right and centre at this wedding! Ben will snuggle her as often as possible? Umm…can he marry us too? Is Ben going for the Unhappiest Wedding Photos award? Photographer: “And, smiling Ben.” Not a hope. Is Ben a young Leonardo? Bel and Hayden’s kisses keep going…and going…and going. When you need to pee and you ask your friend to come with you…this ain’t gonna be good. “You’re gonna break his little heart.” Could you be any more condescending, Ben’s friend? Aaron’s realised that it’s not good. We’re feeling for ya, bro. At least Bel and Hayden only have eyes for each other. Oh Ben, we’re sorry your parents aren’t there for you. And your mum is your best friend…this is even worse. Aaron’s amazing family is giving Ben all the feels. Bel’s putting on a bib? Vegetarian vs carnivore. Wrestler vs “I hate fighting.” Let’s take this one slllowwww. Bel: “I’m an open book with that kind of thing…we’re already married.” Well, we know where this is going. Hayden is a man of his word. Alllll the snuggles. Check out the body language. This wedding night won’t be too exciting. Ben is slurring. He’s been drinking his feelings. Great teasers, THREE. We’ll be back for sure! Miss last week's episodes? Here's our thoughts about episode one and two.